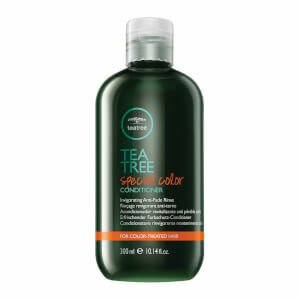 Treat coloured hair to the Paul Mitchell Tea Tree Special Colour Conditioner; a lightweight, detangling formula that works to restore softness, moisture and shine from root to tip. Infused with a host of beneficial ingredients, including Lavender, Peppermint and Tea Tree Oil, the invigorating daily conditioner moisturises and hydrates, whilst improving manageability and maintaining colour vibrancy for a salon-worthy finish. Hair feels fresh with a rejuvenating fragrance. Aqua (Water, Eau), Cetyl Alcohol, Behentrimonium Methosulfate, Behentrimonium Chloride, Dimethicone, Parfum (Fragrance), Glycerin, Glyceryl Stearate SE, PEG-7 Glyceryl Cocoate, Melaleuca Alternifolia (Tea Tree) Leaf Oil, Aspalathus Linearis Leaf Extract, Bis(C13-15 Alkoxy), PG-Amodimethicone, Maltodextrin, Stearyl Alcohol, Butylene Glycol, Isopropyl Alcohol, Dimethiconol, Acetamidopropyl Trimonium, Chloride, Pentaerythrityl, Tetracaprylate/Tetracaprate, Acrylamidopropyltrimonium, Chloride/Acrylamide, Copolymer, Laureth-23, Aminopropyl Dimethicone, C14-15 Alcohols, Isotridecanol, Laureth-4, Sodium Salicylate, Tetrasodium EDTA, Methylisothiazolinone, Methylchloroisothiazolinone, Magnesium Nitrate, Magnesium Chloride, Citric Acid, Limonene, Linalool, CI 16035 (Red 40), CI 42090 (Blue 1), CI 15985 (Yellow 6).